Did you run that as Admin? Event ID 41's (unexplained shutdown) in the System event viewer logfile - gotta wonder about hardware issues. Have asked others to have a look at it also. This may get a bit confusing, but I think that the extra "eyes on" the problem will help to rapidly solve your issues. The driver detected a controller error on \Device\Harddisk3\DR4. The driver detected a controller error on \Device\Harddisk3\DR47. The driver detected a controller error on \Device\Harddisk3\DR5. The file system structure on the disk is corrupt and unusable. Please run the chkdsk utility on the volume H:. Boot with SeaTools CD; run LONG test. I have checked and rechecked for all *.dmp files on all drives, have found none. there is no c:\windows\minidump drectory either, what is wrong with this? how can this happen????? Using win 7 os 64 bit all new parts exept drives, even os new about 3 months ago, was recording to media fine till about 2 weeks ago. now just crash/shut off when inserting recordable media in cd/dvd drive. I would love to try this!! HOWEVER I am unable to make CD with my burner, it kills system cant see any other options? Should I just reinstall os and try from scratch again? Do you have a spare (blank) USB drive? And, do you know if your computer supports booting from USB? Okay... Download this and save it to your desktop. Then, download unetbootin from http://unetbootin.sourceforge.net/. Insert your USB drive and note the drive letter. 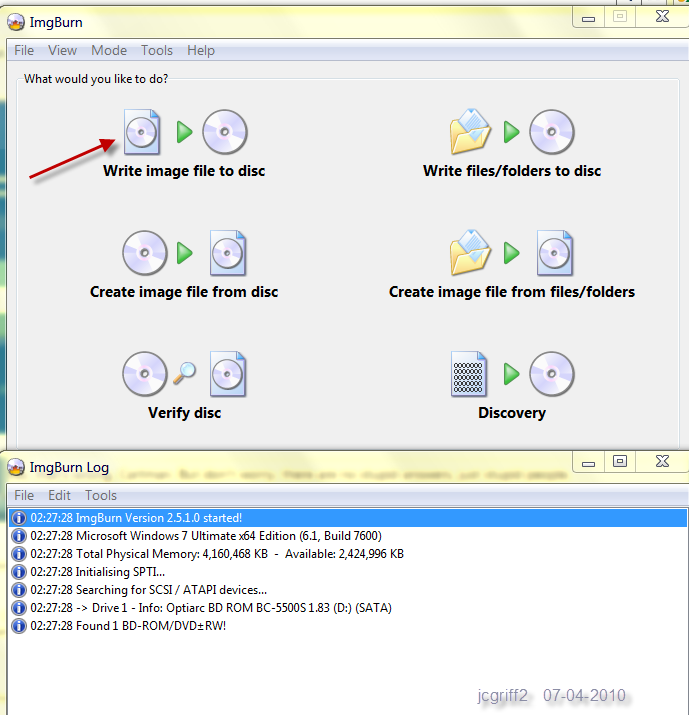 Select "Diskimage" from the bottom of the screen. Browse and select the .iso image you saved to your desktop. Select your USB drive from the drive selection menu. Click the button to make the USB. You may be prompted that there is already a file "syslinux.lvm" and do you want to overwrite it. That is okay. Unetbootin will extract the .iso and copy it to the USB drive, then make the USB drive bootable. When it completes, reboot your computer and invoke the BBS (bios boot select) menu or enter setup to make the USB drive boot first. When the USB boots you should see a menu. Select Hard Drive (HDD) from the menu. Select a diagnostic test. I suggest using the latest release. Just FYI - there's many, many different reasons for missing dump files. You can see from that that there are many, many different reasons for memory dumps not to be captured. No need to reinstall Windows just yet (although that is an option - I'd suggest making sure that you've backed up all your stuff). Work with us and we'll figure out what the problem is. Then, once that's fixed, we'll see what we can do about memory dump generation. usasma's page is more comprehensive. Hope this helps some, I have drives C: = 1tb D: = 2tb E: = 1tb 3 individual drives, plus 1 cd/dvd burner = F: , THERE IS NO G: UNLESS IT IS ONE OF MANY FLASH DRIVES, I do not understand why win 7 says they are not correct format or some such thing. always asking if win should fix them, I dont want them fixed because they might not work in my win xp system after fixing. could the problem be in software? I might have installed ( I-tunes ) just before this started, think it might be a copywright block of some kind? I have all music cd's in my library and am allowed to make personal copies for my use, so as not use / damage originals. sorry to be such a pain. I used to build computers and I cant think of any other hardware issues that would cause this to happen. Does the system crash in Safemode too? - only when a blank CD-R is inserted? - what about a non-blank disc? Can you swap out the DVD drive? No dump files are being produced. While individually these could be software or hardware - the consistency of them seems to point to a problem with a drive, then mobo, or the cables/connections to them. Testing the CD/DVD will involve disconnecting the device and seeing if the problem continues (trying another, known-good CD/DVD if possible). Testing the hard drives (ALL of them) will tell us if it's the hard drive. The cabling is actually a bit more difficult. Disconnect as much power from other devices as you can - this may help to see if it's a PSU issue (the theory here is that less power demands should lessen the frequency of problems). We can try to rule out the G:/H: drive problem by ensuring that no devices are plugged into the USB port and then generating another MSINFO32 report (or another jcgriff2 report). It's possible that Nero or another disk emulator program has installed these drives - but if so, they should be visible in Windows Explorer. If the problem remains after all that, then we have to look at the mobo. Power issues, BIOS issues, connection issues (of devices other than those we've already discussed), grounding issues can all produce problems like those that you are experiencing. yes that is HD config However I have a (hotswap/usb drive slot on top of case, could be I had a drive in it at some point. but works fine if recorded on with music or video, just blank disk causes problem. I have not gone to safe mode yet, all works fine till I try to use blank CD. I have an older dvd but it is same make, would rather use different brand/make to test if it is drive. Test with the old one. You don't even have to mount it in the case. Just shut down, pull the cables from the one in the case and put them into the old drive. See if you can use a blank CD without crashing then. If so, then it's likely that it was the drive. If not, then we'll look elsewhere while waiting for the new DVD drive. Sorry not home often, but trying to get solved. I tried a dvd+r dl blank disk seems fine, just the cd-r disks affect the system possibly cd+r but don't have one to check with. will try SONY DVD drive and let you know soon. Thank you for posting back - much appreciated. Good luck with the new DVD drive.